Minister Edna Molewa to be awarded French Legion of Honour, 13 July 2018. Minister Molewa launches R30 million Gauteng Youth Jobs in Waste in Randfontein, 28 July 2016. The CITES Ministerial dialogue for key States concerned with the illegal trade in rhinoceros horn was convened by the CITES Secretariat, 14 February 2015, Geneva. Eco-Desk handover, Pietermaritzburg, 10 February 2015. World Wetlands Day celebration, False Bay Nature Reserve, Cape Town, 02 February 2015. Minister Edna Molewa highlights progress in the war against poaching and plans for 2015, Pretoria, 22 January 2015. Celebration of 15 Years of EPIP and the launch of EPIP Projects, Mpumalanga, 05 December 2014. Minister Edna Molewa led the SA delegation during the twentieth session of the Conference of the Parties (COP20), Lima, Peru, 01 - 12 December 2014. IUCN 6th World Parks Congress, Australia, Sydney, 12 November 2014 - 19 November 2014. The signing of the Business Plan between the Republic of South Africa and the Kingdom of Norway in Pretoria, 14 November 2014. The Department of Environmental Affairs planted two hundred riverbush willow trees near Allandale Road, Midrand, 14 November 2014. 2014 National Climate Change Response Dialogue, Gallagher Convention Centre, 10 – 13 November 2014. The official opening of the Masibekela Recreational Park, Masibekela Village, Nkomazi Local Municipality, Mpumalanga, 28 October 2014. President Jacob Zuma officially opens Environmental Affairs’ Green Building, 17 October 2014. Operation Phakisa Open Day, Durban, 15 October 2014. Environmental Affairs new premises - Environment House. 19th BASIC Ministerial Meeting on Climate Change, Sun City, South Africa, 10 October 2014. Historic Biodiversity Offset Agreement signed by the DEA, SANPARKS and Coal of Africa for Vele Colliery, Leriba Lodge, Pretoria, 08 October 2014. The launch of the NECER 2013/14 and GEF Rhino Project, 08 October 2014. 9th Annual Air Quality Governance Lekgotla, Umhlanga, Durban, 06 October 2014. The Global March 4 Elephant, Rhino and Lion, Pretoria, 04 October 2014. The officially launch of the Kwelera National botanical Gardens, East London, Eastern Cape on Tuesday, 30 September 2014. World Rhino Day, Bushbuckridge, Mpumalanga, 22 September 2014. The 6th People and Parks Conference, Dan’s Country Lodge & Event Centre, Umthatha, Eastern Cape Province, 09 September 2014. Highway Africa Conference, Rhodes University, Grahamstown, Eastern Cape, 08 September 2014. The launch of the National Parks Week, Eastern Cape; Tsitsikama, 08 September 2014. Parliament's Portfolio Committee on Environmental Affairs, will hold Public hearings, Phumlani Community Hall, Hluhluwe Local Municipality, 29 - 30 August 2014. The hand over of the Provincial Resorts and Reserves Project, Free State, Sandveld Park and Resort, 28 August 2014. Deputy Minister Ms Barbara Thomson launches the Cato Manor Recycling Depot, Cato Manor, Durban, 22 August 2014. The unveiling of the Ranger Monument, Kruger Gate, Kruger National Park, 31 July 2014. Minister Edna Molewa led the clean-up campaign in celebration of International Mandela Day for 67 minutes, Khayelitsha, Cape Town, 18 July 2014. Deputy Minister Ms Barbara Thomson led a successful clean-up campaign during the Nelson Mandela Day, Pietermaritzburg, KwaZulu–Natal, 18 July 2014. Deputy Minister Ms Barbara Thomson led the commemoration of World Day to Combat Desertification, Ladybrand, Free State Province, 27 June 2014. Environment Month celebrations, Durban Beachfront, KwaZulu-Natal, 20 June 2014. The launch and hand over of Mthatha Dam Tourism and Recreational Centre Project, Eastern Cape, 30 April 2014. South Africa and Mozambique sign a MoU in the field of Biodiversity, Conservation and Management, Skukuza, Kruger National Park, 17 April 2014. National Green Jobs Dialogue, DBSA, Vulindlela Conference Centre, 09 April 2014. Deputy Minister, Ms Rejoice Mabudafhasi launched the War on Waste and War on Leaks projects, Butterworth, Mnquma Local Municipality, Eastern Cape, 08 April 2014. The celebrations of the World Meteorological Day, North West, 10 March 2014.
International Coastal Clean-up Day, Saldanha Bay, 27 September 2013. Minister Molewa launches the Annual National Parks Week, Kimberley, Northern Cape, 9 September 2013. Minister Molewa leads departmental participation in the Highway Africa Conference, September 2013. 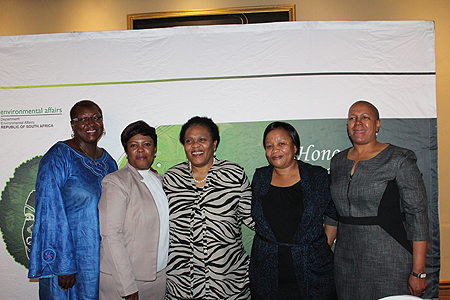 Minister Molewa launches "Farming the Wild" Green Fund Project and Green Economy Modelling report, 23 August 2013. Mayors’ Dialogue on Waste Management, Water Conservation, Women and Youth Development, Emperor’s Palace, Ekurhuleni, Gauteng, 06 August 2013. Stakeholder Engagement Forum at the Protea Hotel, O.R. Tambo International in Kempton Park, 01 August 2013. Mandela Month Celebration, Siloe School for the Blind, Thokgwaneng, Limpopo,26 July 2013. Rhino Issue Management Report released by the Department of Environmental Affairs, 24 July 2013. Mandela Month activities at Boitumelo Special School, Galeshewe, Kimberley, Friday, 19 July 2013. Greenest Municipalities Competition awards and a hand over of a Buy Back Centre and Composting Facility, KwaZulu Natal, 28 June 2013. The 15th BASIC Ministerial Meeting on Climate Change, Cape Town, South Africa, 26 - 28 June 2013. The launch of the Youth Jobs in Waste Programme, Phuthaditjhaba, Free State, 17 June 2013. Commemoration of the World Day to Combat Desertification (WDCD), Sterkspruit, Eastern Cape, 14 June 2013. The launch of the Groen Sebenza Project, 08 June 2013. World Environment Day & Green Cars Exhibition, 5 June 2013. 2013/14 DEA's Budget Vote Gala Diner, 28 May 2013. 2013/14 DEA's Budget Vote and Green Cars Exhibition, 28 May 2013. Minister Molewa launches the Mining and Biodiversity Guideline and receives the Life: State of South Africa’s Biodiversity report, 22 May 2013. South Africa and Vietnam sign Biodiversity Conservation and Protection Implementation Plan, 6 May 2013. The official hand-over of Mdantsane Eco-Park, 19 April 2013. Community Outreach Program – Cleaning Up Campaign And Borehole Resuscitation Project, 2 March 2013. 7th Pan-African Access and Benefit Sharing(ABS) Workshop in Phalaborwa, Limpopo, 25 February - 01 March 2013. World Wetlands Day celebration, KouKamma Local Municipality, Eastern Cape, 1 February 2013. Hand over of 250 school desks to Boitumelo High School in Ficksburg, Free State, 23 January 2013. South Africa and Vietnam sign a MoU on cooperation in the field of Biodiversity Conservation and Protection, 10 December 2012 . Minister Edna Molewa at the Climate Change Conference in Qatar, COP18, 6 December 2012. Global Network of Women Ministers and Leaders for the Environment Meets At UNFCCC Cop 18 in Qatar, 4 December 2012. Minister Edna Molewa addressing the media during the official launch of the NECER 2011/12 in Cape Town, 22 November 2012.